Yesterday we spent little time in the Atocha train station because we'd flown all day and will spend three nights in Madrid at the end of our trip but to describe it as stunning would be an understatement. The AVE side is a marvelous indoor garden under a windowed ceiling. It reminded me of the Orsay museum in Paris which is fitting since that is also housed in an old train station. Today in Toledo we took a couple hours to admire the interior grandeur of the Cathedral which I briefly mentioned yesterday. It's a mixtures of the eras it was built in (1226-1495). The lavish detail of the High Altar with its gold-plated iron grille is dizzying and the art in the Sacristy is represented by the likes of Caravaggio, Rubens, Giovanni Bellini and-the darling of Toledo-18 Domenikos Theotokopoulos' (El Greco). My favorite part of the Cathedral, however, was the Transparente...a hole cut into the ceiling framed with Baroque art. Tapas and wine at El Caprichito in Diputacion Provincial near Calle de Buzones. Sat at the bar and Santi (Santiago) was accommodating, charming, well-liked by locals. Small hangout near a main artery but no tourists coming in. Watched throngs of groups walking by headed several blocks away to the Cathedral, no doubt. It's 2 pm now (when we were eating) and we're the only English-speaking people in El Caprichito. The Crianza makes me giddy as I watch the orchestrated way Santi grabs food from the small counter between him and the two ladies skillfully serving up all kinds of foreign-looking foods. Dan ends up with 'Bambi' after I ordered him una media-racion con carne (half ration of tapas with meat) and I'm served the typical bacalao which is salted cod. Mine is deep-fried and drizzled with honey. Santi also gave me another white fish tapa that had some potato chips atop it, several sweet green olives and was drizzled with picual olive oil and vinegar. The white wine I'm now having (intentionally ordered because I know he's giving me white fish of some kind) cut the high acidity perfectly. 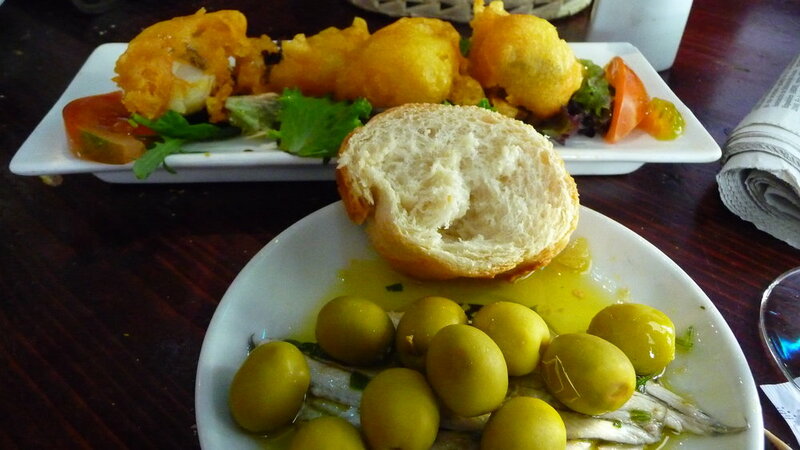 I decided to eat only the fish in the bacalao but it's SO SALTY it has to be cut with the deep-fried mixture. Note to self: no more bacalao or I'll have a coronary before I leave Spain. I'm now drinking all the water in my bottle but it's still a do-over moment in my mind. One block away we ducked into our apartment for a 30 minute siesta before venturing back into the maze of streets for more sightseeing. 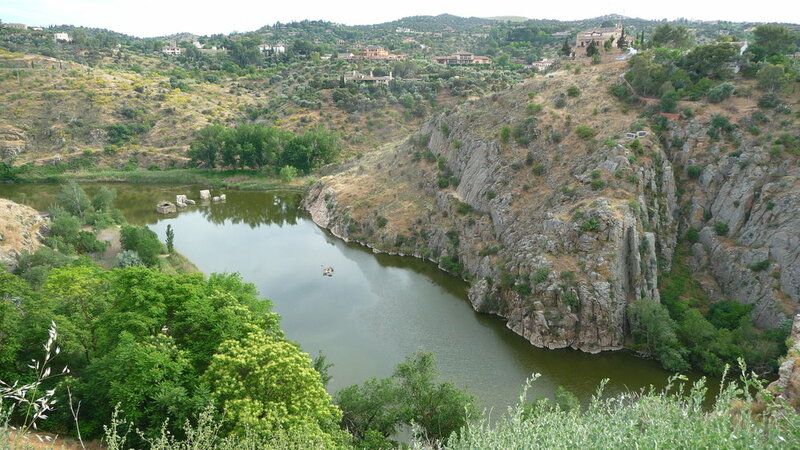 This has to be the perfect place to dip our feet in Spain. Everyone's been so friendly and patient as we incorporate more and more Spanish into our vocabulary. We spent a few hours wandering around mesmerizing Toledo and took Rick Steves' advise by riding bus #12 all around the town...an inexpensive option to the more cheesy tourist buses. The streets are narrow and it's a kick to see how the drivers all know to pull over when a bus is heading toward them. No way two cars will fit...and the buses are allowed to go the 'wrong way' on all streets. That'd be a rude awakening if you weren't from around here, huh? 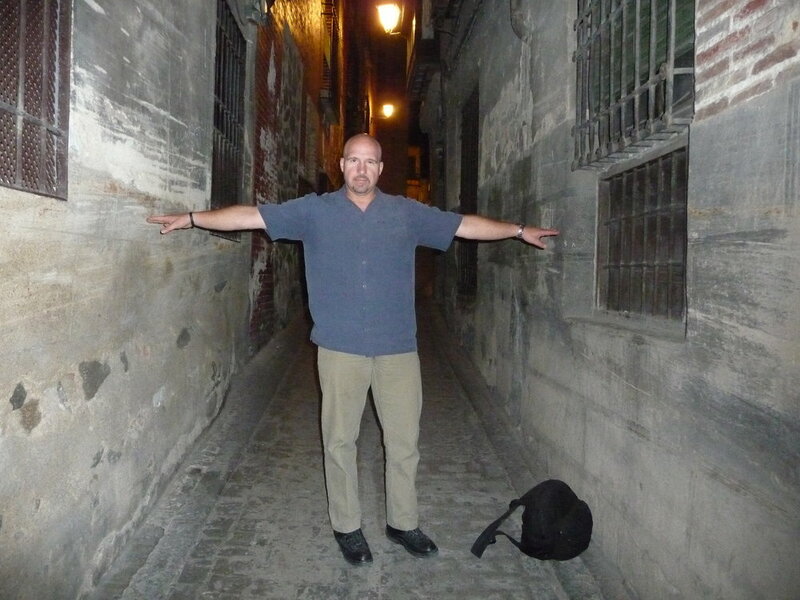 We took a picture of Dan standing in the middle of a typical street..his arms outstretched...to show the width. Needless to say, we haven't seen an SUV. This is not a side walk. It is a typical Toledo road...for cars. My dinner-ensalada de bonito-tuna, peppers, tomatoes and olives with gazpacho which is not pictured. Dinner tonight was at 9 pm. Gosh, it really hasn't taken long to adjust to the Spanish time of eating...and we're still rather early at 9 pm. More Crianza with dinner at 2 euro a glass. It'll be hard to come back to $8-$10 wine that I might not even be thrilled with after 2 euro wine that is fantastic. Again, we were the only English-speaking people in the place. Apparently there's a big celebration in Madrid (yesterday and the next few) so lots of Spanish people flocking to Toledo the way we head for Seaside or Long Beach maybe.